Úvod » RiTEK M-Disc BD-R 25 GB Printable, 25 Pack, Životnosť 1000 rokov. Vytesajte svoje dáta do skaly a vydržia večnosť! Samozrejme, že nemusíte brať do ruky dláto a kladivo – stačí, keď sa zoznámite s čerstvou novinkou: potlačiteľné BD, DVD M-DISC so životnosťou 1000 rokov sú tu! Médiá M-DISC sú novým riešením, ako ukladať dáta, bez toho aby ste museli mať strach, že o ne prídete. Dokonca boli testované aj americkým ministerstvom obrany. Sú odolné voči extrémnym svetelným či teplotným podmienkam. Dáta z týchto M-diskov sa nedajú prepísať, vymazať ani ich nepoškodia iné vplyvy. Najväčšou výhodou je, že tieto médiá sú kompatibilné so všetkými BD, DVD prehrávačmi, môžete tak pristupovať k dátam kedykoľvek a kdekoľvek. A sú potlačiteľné! 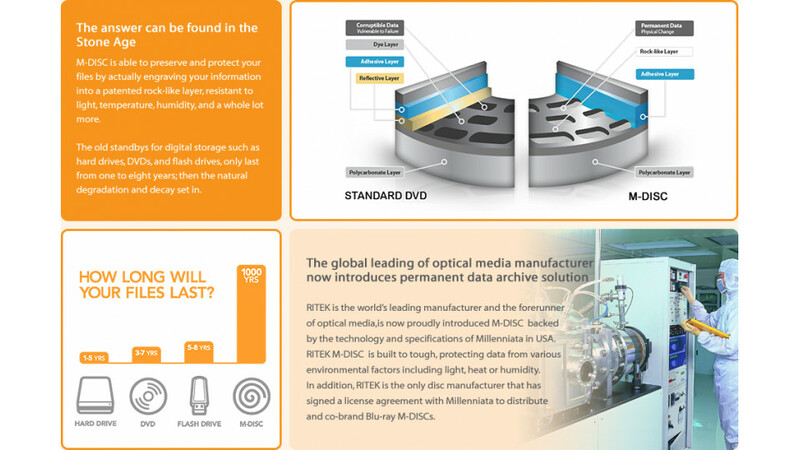 RITEK M-DISC is the new standard in digital storage media. M-DISC is backed by the technology and specifications of Millenniata U.S.A. 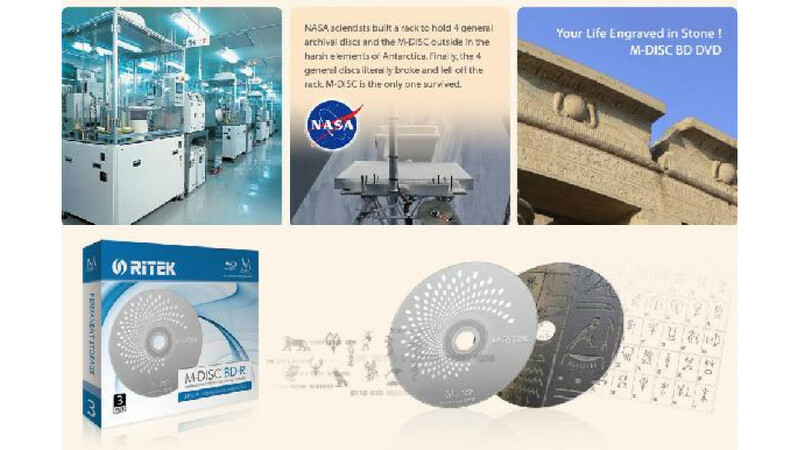 The M-DISC technology allows for saving and protecting the data by etching them into a rock-like material, which is proven to withstand for up to 1,000 years! 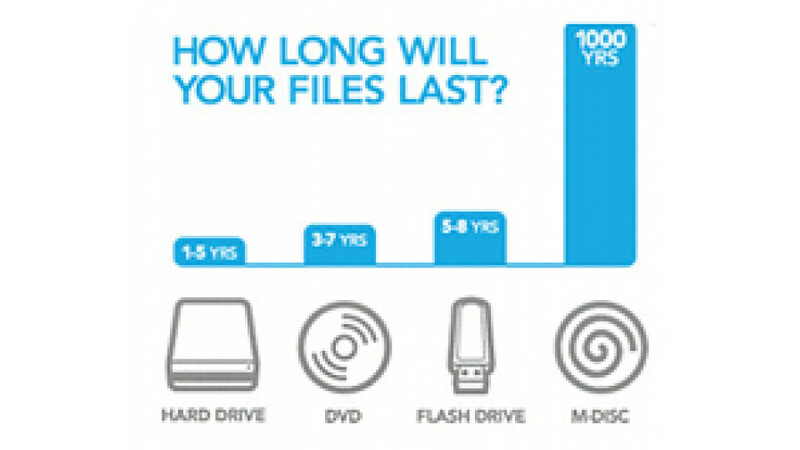 Now, you can rest assured and never worry to lose your valuable information with M-DISC. RITEK M-DISC is built to tough, protecting data from various environmental factors including light, heat or humidity. 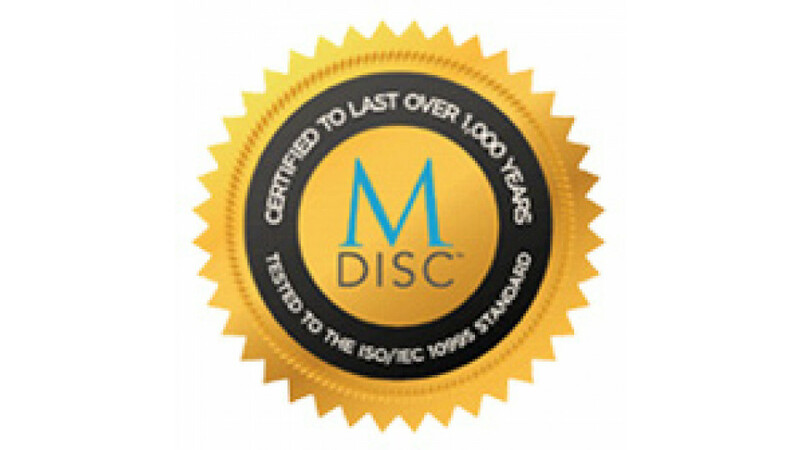 Moreover, M-DISC will not degrade over time and is designed for everyday use. Its toughness and endurance have been well proven by multiple testing, including those performed by the U.S. Department of Defense. Those test result concludes that the M-Disc will last for centuries. Stability: M-DISC uses a patented rock-like recording surface instead of traditional organic dye to etch your records. Engrave in Stone: When the data layer is written by a focused laser, the intense heat generated causes the innermost layers to melt and to move away from the laser spot, creating a hole in the data layer. The Data Layer: The data layer is composed entirely by inorganic materials and compounds, including metals and metalloids. 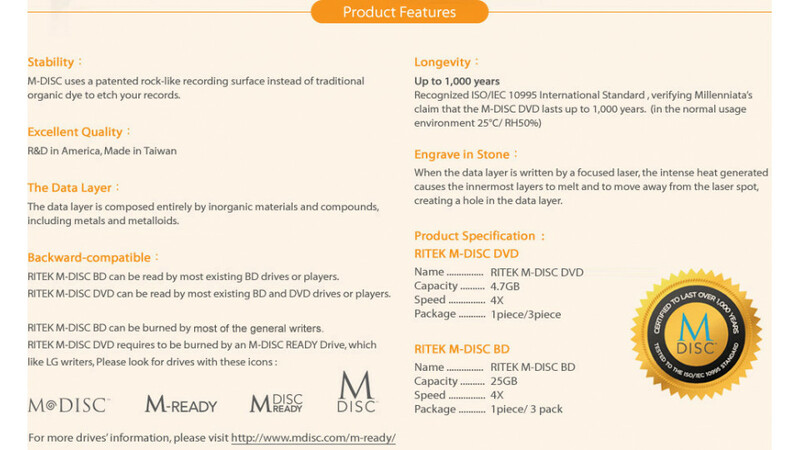 RITEK M-DISC BD can be read by most existing BD drives or players. RITEK M-DISC DVD can be read by most existing BD and DVD drives or players. RITEK M-DISC BD can be burned by almost general writers. Especially perfect for: Government institutions, business and consumers need to permanently archive large quantities of digital information.